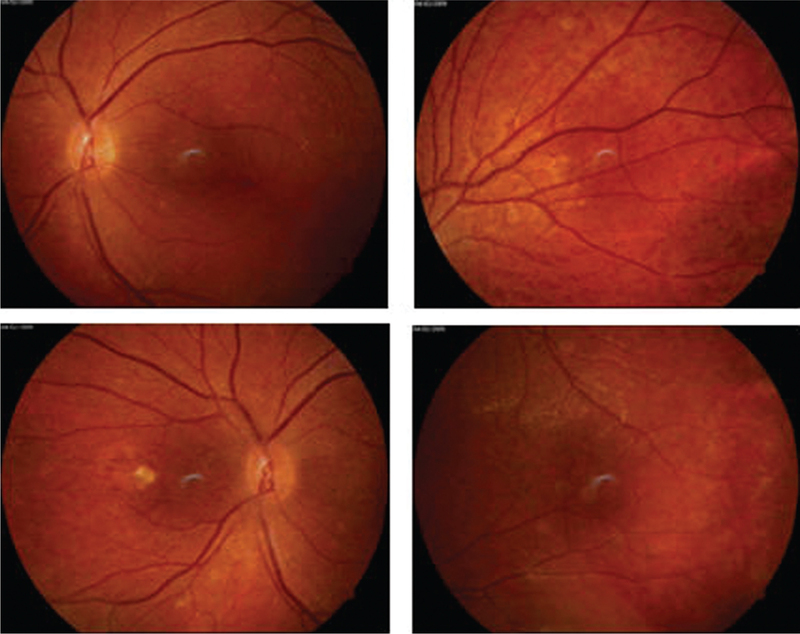 Purpose The purpose of this study was to describe the clinical features of 10 cases of a rarely reported internal limiting membrane dystrophy with glistening retinal reflex and peculiar fundus mottling. Patients and methods This is a retrospective review of 10 patients attending the outpatient clinic of Mansoura Ophthalmic Center in the period between 2000 and 2014. For all cases, measuring BCVA, fundus examination and fundus fluorescein angiography were done. Optical coherence tomography (OCT) was done for nine patients, with one patient missed (was not accessible for the investigation). Results The study included 10 unrelated patients − three female and seven male. The age ranged from 21 to 36 years (mean: 27±0.5 years). The mean visual acuity was 0.3±0.04. In all cases, fundus examination revealed the presence of a peculiar reddish mottling, with glistening retinal reflex and areas of epiretinal membranes and distortion of retinal blood vessels. Fundus fluorescein angiography revealed capillary dye leakage all over the retina with cystoid macular edema in five eyes. In one patient, abrupt cessation of retinal blood vessels was evident in the temporal retina. OCT revealed the presence of epiretinal membranes and schisis cavities in all retinal layers. Secondary choroidal neovascular membrane was evident in one eye. Conclusion Internal limiting membrane dystrophy is an extremely rare hereditary disorder that presents early in life (second-third decade) with early drop of vision. Clinically, it presents with glistening retinal surface, epimacular membranes and peculiar reddish mottling of the whole retina extending from the central retina to the far periphery. Fluorescein angiography shows capillary leakage all over the retina and cystoid macular edema. OCT shows schiscis cavities in all retinal layers. Some cases are complicated by choroidal neovascular membrane. Apart from retinitis pigmentosa, retinal dystrophies characterized by glistening of the inner retinal surface without vitreous degeneration have been rarely reported in the literature, differently described and given different terminologies. Dystrophies with glistenting retinal reflex have been reported by Dalma et al. and they called this dominantly inherited cellophane-like sheen vitreomacular dystrophy. Polk et al. described a similar condition and named it familial internal limiting membrane (ILM) dystrophy. Kellner et al. and Renner et al. reported retinal dystrophy with characteristic sheen and named it Muller cell sheen dystrophy (MCSD). 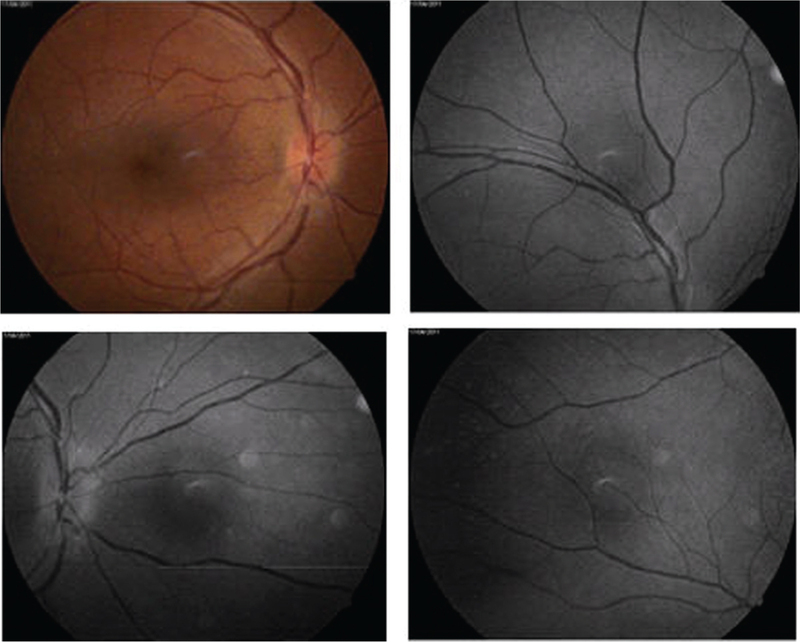 This study aimed to describe a series of 10 unrelated patients with dystrophy presenting with glistening retinal reflex and peculiar fundus mottling. This is a retrospective review including unrelated patients with retinal dystrophy with characteristic glistening retinal reflex. Ethics approval from the institutional review board was obtained, and a written consent was taken from every patient. For all cases, measurement of best-corrected visual acuity (BCVA), fundus examination, and fundus fluorescein angiography were performed. Optical coherence tomography (OCT) was performed for nine patients, with one patient missed (was not accessible for the investigation). This study included 10 unrelated patients − three female and seven male. The age ranged from 21 to 36 years (mean: 27±0.5 years). The mean visual acuity was 0.3±0.04. In all cases, fundus examination revealed the presence of a peculiar reddish mottling, evident deep to retinal blood vessels extending from the macula to the far retinal periphery with glistening retinal reflex and areas of epiretinal membranes and distortion of retinal blood vessels. Fundus fluorescein angiography revealed altered retinal vascular permeability with capillary dye leakage all over the retina. The leakage was evident at the macula in five eyes of three patients. In one patient, cystoid macular leakage was evident in one eye with retinal pigment epithelial (RPE) atrophy (window defect) at the macula of the other eye, which suggests that the edema with time subsides with residual RPE atrophy. In one patient, abrupt cessation of retinal blood vessels was evident in the temporal retina in both eyes with distortion of the retinal blood vessels at the junction between the perfused and nonperfused retina. OCT revealed the presence of epiretinal membranes, schitic cavities in all retinal layers, central and peripheral, and cystoid macular edema. 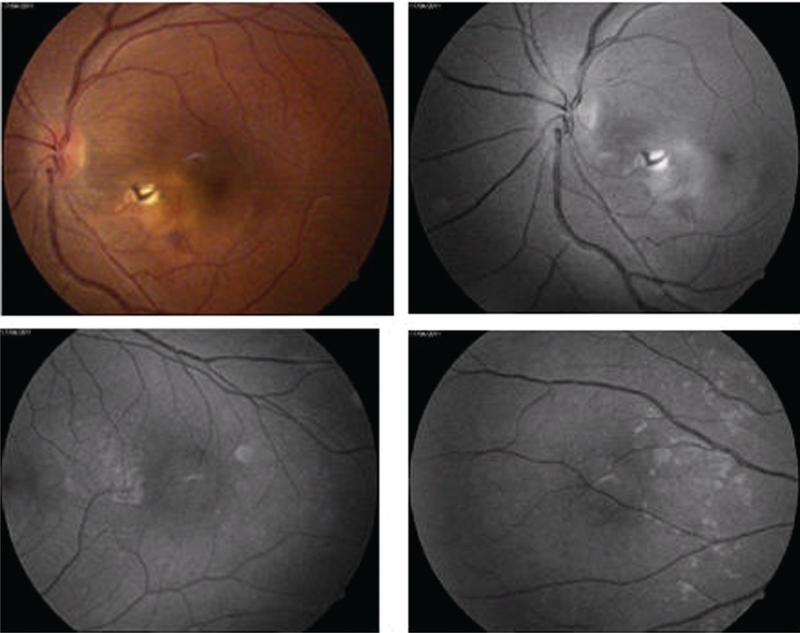 In a 21-year-old woman, one eye revealed the presence of secondary extrafoveal, choroidal neovascular membrane. Case 1 was a 26-year-old man with bilateral drop of vision with BCVA of 0.3 in both eyes ([Figure 1],[Figure 2],[Figure 3],[Figure 4],[Figure 5],[Figure 6]). Figure 1 Fundus photography of the right eye of case number 1, showing peculiar reddish mottling deep to retinal blood vessels involving the whole retina with areas of glistening and macular edema. Figure 2 Fundus fluorescein angiography of the right eye of case number 1, showing fluorescein leakage all over the retina with cystoid macular leakage. Figure 3 Optical coherence tomography of the right eye of case number 1, showing cystoid macular edema, sensory retinal detachment and schisis cavities. Figure 4 Fundus photography of the left eye of case number 1 showing similar changes with epiretinal membrane and distortion of the temporal retinal blood vessels. Figure 5 Fundus fluorescein angiography of the left eye of case number 1 showing abrupt cessation of retinal blood vessels in the temporal retina with vascular distortion (arrows) and window defect at the macula. Figure 6 Optical coherence tomography of the left eye of case number 1 showing schisis cavities in all retinal layers. Case 2 was a 32-year-old man with bilateral drop of vision with BCVA of 0.3 in the right eye and 0.5 in the left eye ([Figure 7],[Figure 8],[Figure 9],[Figure 10],[Figure 11],[Figure 12]). Figure 7 Fundus photography of the right eye of case number 2 showing peculiar reddish mottling deep to retinal blood vessels involving the whole retina with areas of glistening retinal reflex. Figure 8 Fundus fluorescein angiography of the right eye of case number 2 showing stationary macular hyperfluorescence (window defect due to retinal pigment epithelial atrophy). Figure 9 Optical coherence tomography of the right eye of case number 2, showing schisis cavities in all retinal layers. Figure 10 Fundus photography of the left eye of case number 2, showing peculiar reddish mottling deep to retinal blood vessels involving the whole retina with areas of glistening retinal reflex. Figure 11 Fundus fluorescein angiography of the left eye of case number 2, showing stationary macular hyperfluorescence (window defect due to retinal pigment epithelial atrophy) and peripheral capillary leakage. Figure 12 Optical coherence tomography of the left eye of case number 2 showing schisis cavities in all retinal layers. Case 3 was a 21-year-old woman with bilateral drop of vision with BCVA of 0.5 in the right eye and 0.2 in the left eye ([Figure 13],[Figure 14],[Figure 15],[Figure 16]). Figure 13 Fundus photography of the right eye of case number 3, showing peculiar reddish mottling deep to retinal blood vessels involving the whole retina with areas of glistening retinal reflex. Figure 14 Fundus fluorescein angiography of the right eye of case number 3, showing stationary hyperfluorescent dots (window defect due to retinal pigment epithelial atrophy). Figure 15 Fundus photography of the left eye of case number 3, showing peculiar reddish mottling deep to retinal blood vessels involving the whole retina with areas of glistening retinal reflex, distortion of blood vessels in the temporal retina. 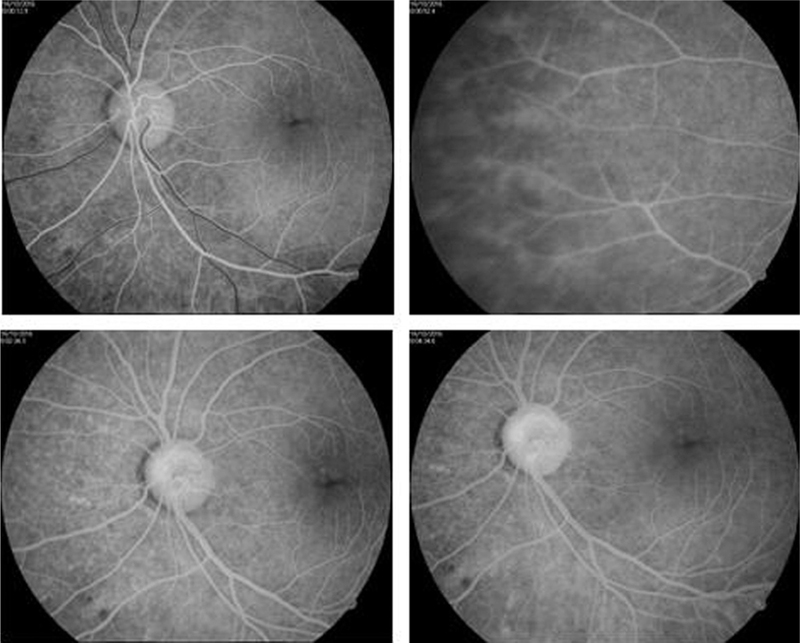 Extrafoveal choroidal neovascular membrane is evident with macular hemorrhage and edema. Figure 16 Fundus fluorescein angiography of the left eye of case number 3 showing minimal capillary leakage, distortion of blood vessels in the temporal retina with extrafoveal classic choroidal neovascular membrane. Sheen retinal dystrophy is hereditary, bilateral, symmetrical retinopathy with prominent fundus sheen. The earliest described entity falling into this category is fenestrated sheen macular dystrophy ,,,. In 1991, Dalma et al. described an abnormal cellophane-like sheen and folds of ILM in ten patients of a single family and called it dominantly inherited cellophane-like sheen vitreomacular dystrophy. Thereafter, there were few reports describing similar dystrophies termed MCSD and, in some studies, ILM dystrophy. In 2013, Dalma et al. 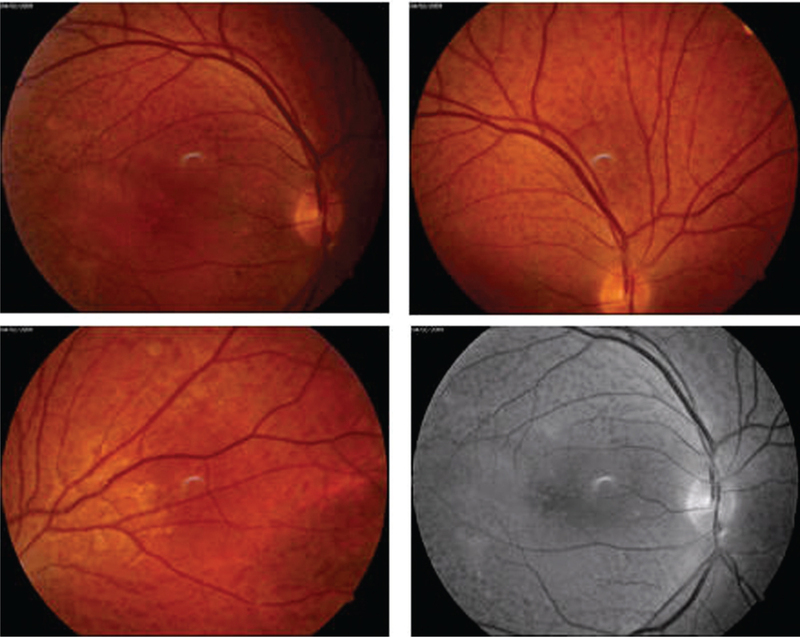 reported spectral-domain OCT changes in these cases showing cystic spaces starting between the ILM and the retinal nerve fiber layer, extending to outer retinal layers over several years (fifth–eighth decades of life). With foveal involvement, cystoid macular edema occured and visual acuity dropped . MCSD is an extremely rare dystrophy that is, so far, limited in the literature. It was reported twice, by Kellner et al. and Renner et al. .
Clinically, MCSD is characterized by glistening folds of ILM at the posterior pole to mid-periphery, fine schitic cavities in the retina and diffuse retinal capillary leakage with cystoid macular edema ,. Fenestrated sheen macular dystrophy differs from MCSD. It typically exhibits yellowish refractile sheen superficial to RPE and deep to retinal blood vessels with red fenestrations in the sensory retina at the macula and normal visual acuity ,,,. Patients later develop enlarging annular hypopigmentation at the level of RPE. Fluorescein angiography shows annular zone of transmission defect without dye leakage. Polk et al. , described the features of three family members with unusual retinopathy, characterized by a glistening inner retinal surface. It differs from fenestrated sheen macular dystrophy. They proposed the term familial ILM dystrophy to describe this newly reported sheen dystrophy and suggested theories of pathogenesis depending on pathologic examination of one patient. Their patients had inner retinal surface glistening, ILM wrinkling, inner retinal schitic cavities and cystic spaces all over the posterior pole. 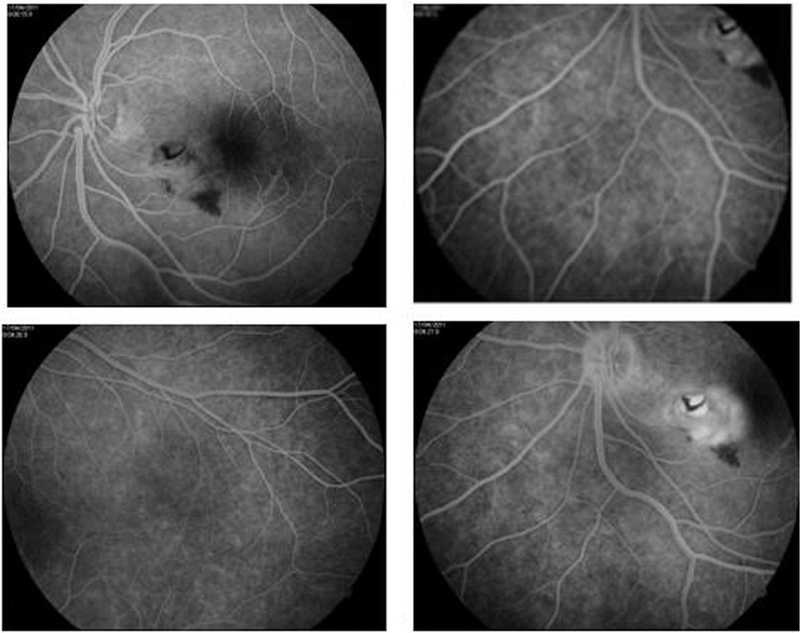 Angiographically, diffuse retinal capillary leakage with intraretinal edema was evident. This leads to vision loss later in life . In our study, which included 10 unrelated patients, similar changes were evident with glistening retinal reflex and epiretinal membranes. What differs from previous reports is the presence of a peculiar rounded and fusiform reddish mottling that was evident extending throughout the fundus from the posterior pole to the far periphery deep to retinal blood vessels. Another previously unreported finding is cessation of the retinal blood vessels at the temporal retinal periphery in two of our cases with distortion of blood vessels at the junction between the perfused and nonperfused retina. Another difference is the age of presentation. The age of presentation in our study group is second and third decades. This differs from cases reported, who present with later onset around the seventh decade ,,. Muller cells extend through the entire neurosensory retina  and provide structural support for the inner retina . Their degeneration or dysfunction may cause intaretinal spaces in all layers; therefore, schisis formation would be expected if a primary defect in Muller cells occurs. This explains the consistent finding of schitic cavities in all retinal layers as in our study and other studies. Muller cells closely appose retinal capillaries and their processes are in close contact with intraretinal blood vessels and the cells play a marked role in the formation of inner blood–retinal barrier ,,. That is why degeneration of Muller cells might, therefore, cause consecutive damage of retinal endothelial cells with subsequent vascular leakage . This explains the leakage of fluorescein dye in three of our study groups at the macula and capillary leakage all over the retina. Dalma et al. and Polk et al. suggested an autosomal dominant mode of inheritance pattern. However, the gene remained unknown. In our study, the patients were unrelated and role of heredity was not documented. Polk et al. , found that vision loss did not occur until at least age of 52 years. Also the amount of vision loss appeared to correlate with the degree of vascular leakage and cystoid degeneration. They hypothesized that the production of abnormal ILM and inner retinal schitic cavities by abnormal Muller cells has little direct effect on vision. Muller cell degeneration may predispose to vascular decompensation and subsequent vision loss . In our patients, visual loss was evident in the third decade of life. Secondary choroidal neovascular membrane was evident in one eye, which was not reported previously. ILM dystrophy is an extremely rare hereditary disorder that presents early in life (second-third decade) with early drop of vision. Clinically, it presents with glistening retinal surface, epimacular membranes and peculiar reddish mottling of the whole retina extending from the central retina to the far periphery. Fluorescein angiography shows capillary leakage all over the retina and cystoid macular edema. OCT shows schiscis cavities in all retinal layers. Some cases are complicated by choroidal neovascular membrane. Dalma A, Dalma-Weiszhausz J, Jimenez-Sierrra JM. 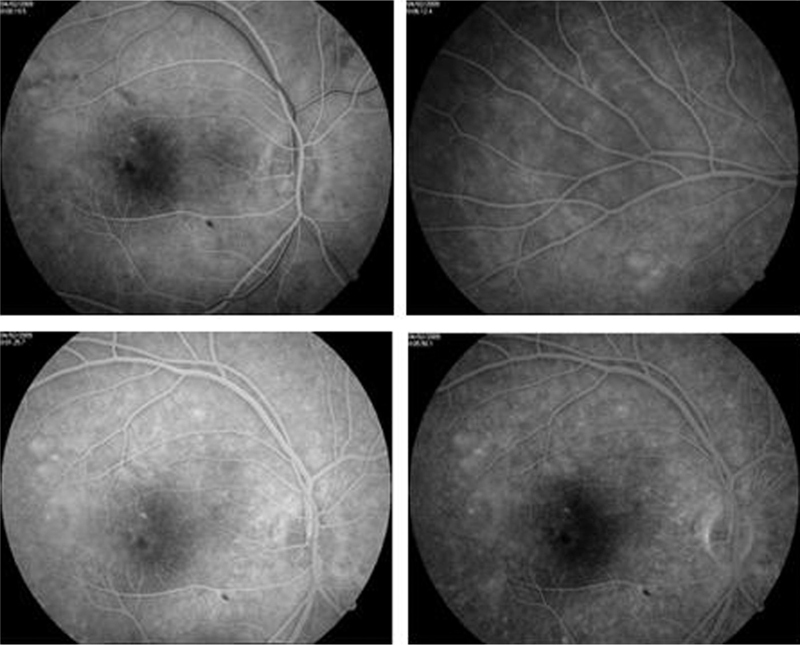 Autosomal dominant late onset cellophane-like sheen vitreomacular dystrophy: a new entity. Invest Ophthalmol Vis Sci 1991; 32:1228. Polk TD, Gass JDM, Green WR, Novak MA, Johnson MW. Familial internal limiting membrane dystrophy. A new sheen retinal dystrophy. Arch Ophthalmol 1997; 115:878–885. Kellner U, Kraus H, Heimann H, Helbig H, Bornfeld N, Foerester M. Electrophysiological evaluation of visual loss in Muller cell sheen dystrophy. Br J Ophthalmol 1998; 82:650–654. Renner AB, Radeck V, Kellner U, Jagle H, Helbig H. Ten-year follow-up of two unrelated patients with Muller cell sheen dystrophy and first report of successful vitrectomy. Doc ophhthalmol 2014; 129:191–202. O’Donnell FE Jr, Welch RB. 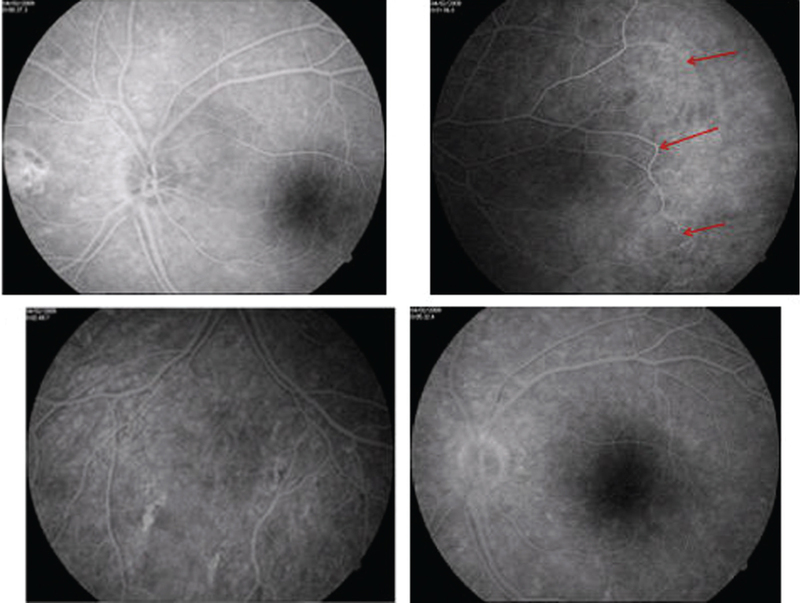 Fenestrated sheen macular dystrophy: a new autosomal dominant maculopathy. Arch Ophthalmol 1979; 97:1292–1296. Slagsvold JE. 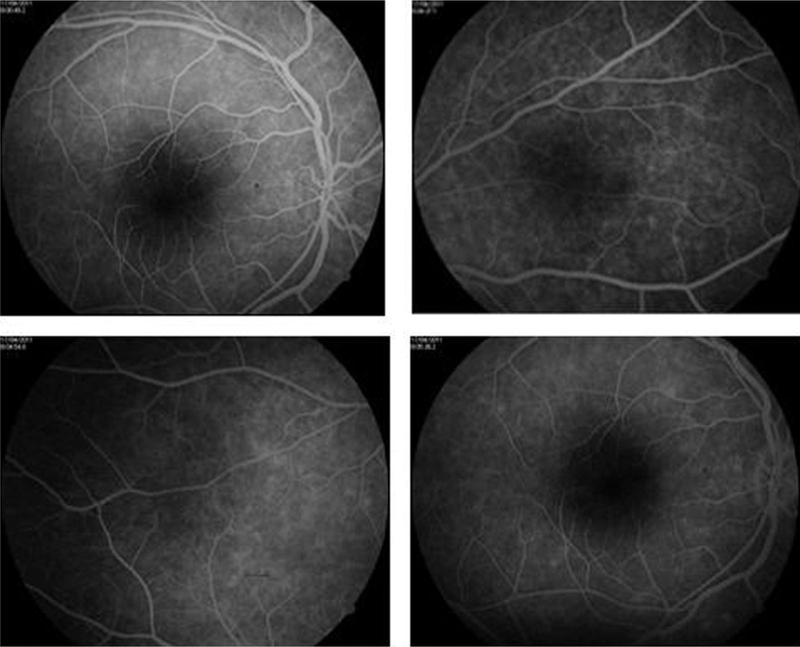 Fenestrated sheen macular dystrophy: a new autosomal dominant maculopathy. Acta Ophthalmol 1981; 59:683–688. Daily MJ, Mets MB. Fenestrated sheen macular dystrophy. Arch Ophthalmol 1984; 102:855–856. Sneed SR, Sieving PA. Fenestrated sheen macular dystrophy. Am J Ophthalmol 1991; 112:1–7. Franco-Cardenas V. Invest Ophthalmol Vis Sci 54. ARVO E-Abstract 5921. Quoted from Renner AB, Radeck V, Kellner U, Jagle H, Helbig H (2014). Ten-year follow-up of two unrelated patients with Muller cell sheen dystrophy and first report of successful vitrectomy. Doc Ophhthalmol 2014; 129:191–202. Reichenbach A, Bringmann A. New functions of Muller cells. Glia 2013; 61:651–678. Green WR. The retina. In: Spencer WH, editor. Ophthalmic pathology: an atlas and textbook. 4th ed. Philadelphia, PA: WB Saunders Co; 1996. 2:673–674. Carlson EC. Human retinal capillary basement membrane leaflets are morphologically distinct: a correlated TEM and SEM analysis. Exp Eye Res 1989; 49:967–981. Tout S, Chan-Ling T, Hollander H, Stone J. The role of Muller cells in the formation of the blood-retinal barrier. Neuroscience 1993; 55:291–301.